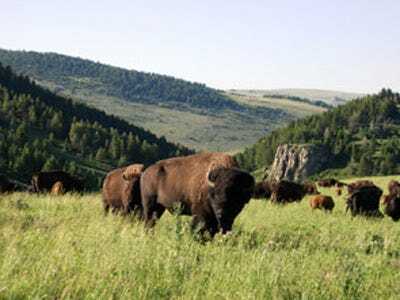 (CNBC) Two billionaire brothers from Texas recently bought 177,000 acres of ranch land in Montana, bringing their total land holdings in the state to more than 276,000. The brothers, Farris and Dan Wilks, who made their money from selling Frac Tech (the oil business), now own 431 square miles in Montana. As large as that sounds, their purchases still don’t rank them in the top 10 individual or family landowners in America. In fact, they would barely crack the top 30. With land prices rebounding, and wealthy families looking for tangible assets large tracts of land have become increasingly attractive investments. Many of the wealthy are still scarred by the market drop of 2008 and want more stable assets. Some use the land for working ranches. Others use it for agriculture, timber or other sources of income. Moon said that the key driver for land buying is production – whether it’s producing crops or timber or beef. “Then if you add to that the recreation use, where you can hunt or fish and things like that, it’s appealing,” he said. But the land rush among the wealthy has led to ever-larger holdings by ever-richer landholders. Here, according to the Land Report 100, are the top five landholders in America and their holdings as of 2012. 1. John Malone The cable tycoon has 2.2 million acres stretching from Wyoming to Maine. One of his crown jewels is the Bell Ranch, a 290,100-acre cattle empire. 2. Ted Turner The media magnate has 2 million acres in Nebraska, New Mexico and other states. He is a strong advocate of wildlife conservation. 3. The Emmerson family This low-profile family holds 1.8 million acres through Sierra Pacific Industries, the nation’s second largest lumber producer. 4. Brad Kelley The reclusive billionaire, who drives a pick-up truck and made his money from discount cigarettes, owns about 1.5 million acres and uses much of it for cattle ranching. 5. The Irving family The Canadian forestry family behind J.D. Irving Inc. owns 1.2 million acres in Maine and other locations. This year alone, J.D. Irving will plan 30 million seedlings. This entry was posted in Autarchy, Capitalism, Closed System, Competition, Current Events, Ecology, Economic Theory, Free Land, Frontier Thesis, Inspiration, Polycentrism, Self-Government, Self-Reliance, Self-Rule, Self-Sufficiency, Systems Theory, Zero-sum. Bookmark the permalink.